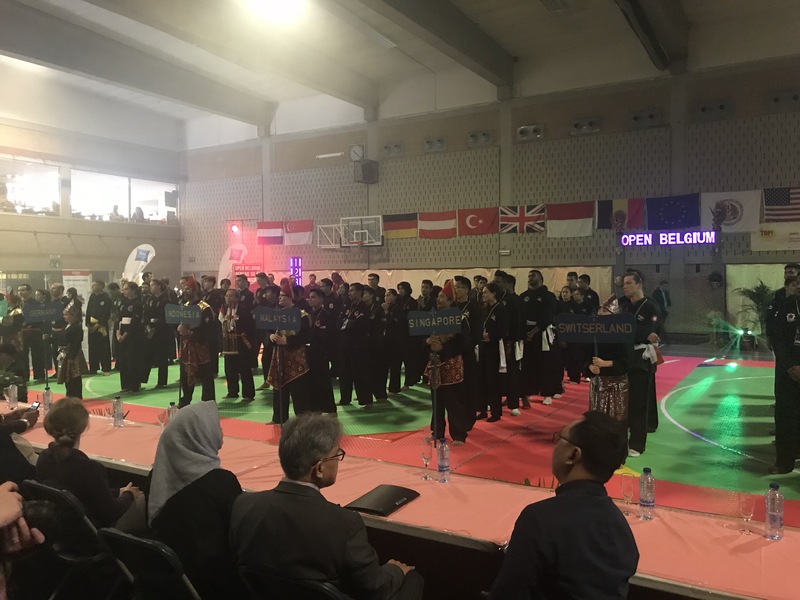 The 35th Belgian Open Championships, held in Schoten from 5-6 May this year, was one of the biggest International Pencak Silat Championships in Europe to date, with over 100 competitors taking part from across the world. The Championships began on the morning of Saturday 5th May with a spectacular performance from IPSI’s demonstration team. The Championships were opened by H.E. Mr Yuri Thamrin, the Ambassador of the Republic of Indonesia to Belgium, & followed by speeches from H.E. Mr Yuri Thamrin, Mr Aidinal Alrashid, President of the European Pencak Silat Federation, & Mr Ludo Pieters, President of the Championship hosts, the Belgian Pencak Silat Bond. The Tanding competitions, in Adult Male, Adult Female, Masters Male, Junior Boys & Junior Girls began after the Opening Ceremony. The competitions were judged by PERSILAT qualified International Wasit Juri from 7 countries, who all attended a refresher course on International Competition Rules & Regulations in the days before the Championships, conducted by Mr Raziz Hussein of PERSISI, who was also PERSILAT’s International Technical Delegate for the competitions. On Sunday 6th May, the competitions continued with Finals in all categories, followed by the Awards ceremonies & presentation of cups. The Awards Ceremony was attended by Mr Maarten de Veuster, the Mayor of Schoten. The Cup for Overall Champions of the 35th Belgian Open went to Singapore, while the Cup for Best Male Athlete went to Muhammad Shakir bin Juanda Sianturi of Singapore, & the Cup for Best Female Athlete went to Sarah Tria Monita of Indonesia. The EPSF Cup for best Wasit Juri was presented to Rick Jansen, International Wasit Juri Level 1, from The Netherlands. The 35th Belgian Open Championships were a tremendous success, thanks to the high standards of the International Wasit Juri, KPs & ITD, & the excellent organisation by the Championship hosts, the Belgian Pencak Silat Bond.